Lower left: "Manet / 1878"
To commemorate the recent Exposition Universelle, itself a celebration of luxury and prosperity, the French government declared June 30, 1878, a national holiday. The holiday, called the Fête de la Paix (Celebration of Peace), also marked France's recovery from the disastrous Franco-Prussian War of 1870-1871 and the bloody, divisive Paris Commune that followed. From his second-floor window, Édouard Manet captured the holiday afternoon with his most precise, staccato brushwork in a patriotic harmony of the reds, whites, and blues of the French flag that waves from the new buildings' windows. The urban street was a principal subject of Impressionist and Modernist painting; many artists aimed to show not only the transformation and growth of the Industrial Age but how it also affected society. Manet's eyes saw both elegant passengers in hansom cabs and, in the foreground, a worker carrying a ladder. The hunched amputee on crutches, perhaps a war veteran or beggar, passes by fenced-in debris left from the construction of a new train track. Manet's sensitivity to the associated costs and sacrifices tempered his optimistic view of national pride and newfound prosperity. Jean-Baptiste Faure, French, 1830 - 1914 (Paris, France), on consignment to Durand-Ruel & Cie, 1894. Durand-Ruel & Cie (New York, New York; Paris, France), sold to Auguste Pellerin, 1898. Jakob Goldschmidt, died 1955 (Berlin, Germany; New York, New York), 1955. Source: GRI, annotated Goldschmidt sale catalogue. Vallet, E. "Exposition de la Société des amis des arts de Bordeaux." L'Art 26 (1881), p. 90. Explication des ouvrages de peinture, sculpture, architecture, gravure et lithographie des artistes vivants exposés dans les Salons de la Société [...], exh. cat. (Bordeaux: Société des amis des arts de Bordeaux, 1881), p. 55, no. 371. Duret, Théodore. Histoire d'Édouard Manet et de son oeuvre (Paris: H. Floury, 1902), p. 254, no. 241. Tschudi, Hugo von. Édouard Manet (Berlin: Bruno Cassirer, 1902), pp. 29-30. Meier-Graefe, Julius. "Pariser Ausstellungen." Kunst und Künstler 2 (1904), p. 378. B. [Oscar Bie]. "Hier und dort." Berliner Börsen-Courier (March 24, 1910). Repr. in 'Ganz eigenartige neue Werte.' Kunstsalon Paul Cassirer: Die Ausstellungen 1908-1910. Bernhard Echte and Walter Feilchenfeldt, eds. (Wädenswil: Nimbus, 2013), p. 412. Rosenhagen, Hans. "Edouard Manet. Zur Ausstellung der Sammlung Pellerin im Salon Paul Cassirer." Der Tag (April 7, 1910). Repr. in 'Ganz eigenartige neue Werte.' Kunstsalon Paul Cassirer: Die Ausstellungen 1908-1910. Bernhard Echte and Walter Feilchenfeldt, eds. (Wädenswil: Nimbus, 2013), p. 424. Ago. [Alfred Gold]. "Manet. Zur Ausstellung der Sammlung Pellerin im Salon Paul Cassirer." Frankfurter Zeitung (April 8, 1910). Repr. in 'Ganz eigenartige neue Werte.' Kunstsalon Paul Cassirer: Die Ausstellungen 1908-1910. Bernhard Echte and Walter Feilchenfeldt, eds. (Wädenswil: Nimbus, 2013), p. 428. L. P. [Ludwig Pietsch]. "Die Manet-Ausstellung." Vossische Zeitung (April 10, 1910). Repr. in 'Ganz eigenartige neue Werte.' Kunstsalon Paul Cassirer: Die Ausstellungen 1908-1910. Bernhard Echte and Walter Feilchenfeldt, eds. (Wädenswil: Nimbus, 2013), p. 433. Edouard Manet (aus der Sammlung Pellerin), exh. cat. (Munich: Moderne Galerie, 1910), unpaginated, no. 18. Die Kunst für Alle 26, no. 7 (January 1, 1911), p. 164, ill.
Hourticq, Louis, Jean Laran, and Georges Le Bas. Manet. 48 planches hors-texte, accompagnées de 48 notices [...] (Paris: Librairie centrale des beaux-arts, 1911), p. 94, pl. 39. Katalog der aus der Sammlung des kgl. Rates Marczell von Nemes-Budapest ausgestellten Gemälde, exh. cat. (Munich: Kgl. Alte Pinakothek, 1911), unpaginated, no. 32, ill.
Meier-Graefe, Julius. Edouard Manet, mit 197 Abbildungen (Munich: R. Piper & Co., 1912), pp. 256, 260-61. Hourticq, Louis, Jean Laran, and Georges Le Bas. Edouard Manet [...] with forty-eight plates (Philadelphia: J. B. Lippincott Company; London: William Heinemann, 1912), pp. 77-78, pl. 39. Katalog der aus der Sammlung des kgl. Rates Marczell von Nemes-Budapest ausgestellten Gemälde, exh. cat. (Düsseldorf: Städt. Kunsthalle, with A. Bagel, 1912), unpaginated, no. 99, ill.
Biermann, Georg. "Die Sammlung Marczell von Nemes." Der Cicerone 5 (1913), pp. 378, 380, fig. 16. "Auktionsnachrichten. Paris. Die Auktion M. von Nemes." Kunst und Künstler 11 (1913), p. 588. Mourey, Gabriel. "La Collection Marczell de Nemes." Les Arts 12, no. 138 (June 1913), pp. 26, 28, ill.
Galerie Manzi, Joyant, Paris. Catalogue des tableaux modernes [...] composant la collection de M. Marczell de Nemes de Budapest [...]. June 18, 1913, unpaginated, lot 110, ill.
Waldmann, Emil. Edouard Manet (Berlin: Paul Cassirer, 1923), pp. 67-68. Moreau-Nélaton, Étienne. Manet raconté par lui-même. 2 vols. (Paris: Henri Laurens, 1926), vol. 2, pp. 46, 57, fig. 299. Fierens, Paul. "Edouard Manet." L'Art et les artistes, n.s., 21, no. 110 (October 1930), p. 29, ill.
Tabarant, Adolphe. Manet: histoire catalographique (Paris: Éditions Montaigne, 1931), pp. 327-29, no. 280. Huyghe, René. "Manet, peintre." L'Amour de l'art 13, no. 5 (May 1932), pp. 174, 177, fig. 64. Jamot, Paul, Georges Wildenstein, and Marie-Louise Bataille. Manet. 2 vols. (Paris: Les Beaux-Arts, 1932), vol. 1, p. 156, no. 289. Jamot, Paul, Georges Wildenstein, and Marie-Louise Bataille. Manet. 2 vols. (Paris: Les Beaux-Arts, 1932), vol. 2, p. 160, fig. 323. Sterling, Charles, Paul Valéry, and Paul Jamot, eds. Exposition Manet, 1832-1883, exh. cat. (Paris: Musée de l'Orangerie, 1932), p. 53, no. 65. "A Great Manet Landscape Exhibited." Art News 35, no. 26 (March 27, 1937), p. 18, ill. Chefs d'oeuvre de l'art français, exh. cat. (Paris: Palais national des arts, 1937), p. 179, no. 360. L'Amour de l'art 18 (May 1937), p. 35, fig. 80. Rey, Robert. Manet (Paris: Éditions Hypérion, 1938), pp. 126, 163, ill.
Frankfurter, Alfred M. "Paris in the Eyes of its Painters: 47 Views of the City over Four Centuries." Art News 37, no. 16 (January 14, 1939), pp. 10, 24, ill.
Views of Paris: Loan Exhibition of Paintings, exh. cat. (New York: M. Knoedler and Company, 1939), p. 18, no. 27, ill.
Pach, Walter, et al. Catalogue of European & American Paintings, 1500-1900 [...]; Masterpieces of Art, New York World's Fair, May to October, 1940, exh. cat. (New York: Art Aid Corporation, 1940), pp. 196, 198, no. 285, ill.
Jedlicka, Gotthard. Edouard Manet (Erlenbach-Zurich: Eugen Rentsch, 1941), pp. 183-84, 277, 404n13. The French Revolution: A Loan Exhibition for the Benefit of Société d'Histoire de la Révolution Française and L'Ecole Libre des Hautes Etudes [...], exh. cat. (New York: Wildenstein, 1943), p. 95, no. 427. Masterpieces by Manet (1832-1883), exh. cat. (New York: Paul Rosenberg & Co., 1946), no. 7, ill.
Florisoone, Michel. Manet (Monaco: Les Documents d'art, 1947), pp. 77, 101, no. 77, ill.
Reifenberg, Benno. Manet (Bern: Alfred Scherz, 1947), pl. 34. Tabarant, Adolphe. Manet et ses oeuvres (Paris: Gallimard, 1947), pp. 324-25, 612, no. 293, ill.
Bex, Maurice. Manet (New York: Continental Book Center, Inc., 1948), p. 33, pl. 65. A Loan Exhibition of Manet for the Benefit of the New York Infirmary, exh. cat. (New York: Wildenstein, 1948), pp. 28, 56, no. 22, ill.
French Painting, 1100-1900, exh. cat. (Pittsburgh: Department of Fine Arts, Carnegie Institute, 1951), unpaginated, no. 108, ill.
Faison, S. Lane, Jr. Edouard Manet (New York: Harry N. Abrams, 1953), p. 20, ill.
Bataille, Georges. Manet. Austryn Wainhouse and James Emmons, trans. (New York: Skira, 1955), pp. 13, 96, 98, ill.
De David à Toulouse-Lautrec: chefs-d'oeuvre des collections américaines, exh. cat. (Paris: Musée de l'Orangerie, 1955), unpaginated, no. 39, pl. 36. "Fine Works on the Market." Apollo 68, no. 404 (October 1958), p. 128, ill.
"The Goldschmidt Pictures at Auction." Art News 57, no. 5 (September 1958), pp. 37, 60, fig. 1. Sammlung Emil G. Bührle, exh. cat. (Zurich: Kunsthaus, 1958), pp. 100-1, under no. 147. "All-Time-High Art Prices." Life (November 10, 1958), p. 86, ill.
"Forthcoming Sales." The Connoisseur 142, no. 572 (November 1958), p. 125, no. 12, ill.
"International Saleroom." The Connoisseur 142, no. 573 (December 1958), p. 194, no. 7, ill.
Sotheby's, London. Catalogue of Seven Paintings by Cézanne, Manet, Renoir and Van Gogh. The Property of the Estate of the Late Jakob Goldschmidt of New York City. October 15, 1958, unpaginated, lot 3, ill.
"50 of the Most Fashionable Pictures in the World." Art News 58, no. 2 (April 1959), pp. 30-31, fig. 3. Masterpieces of Impressionist and Post-Impressionist Painting, exh. cat. (Washington, D.C.: National Gallery of Art, 1959), p. 17, ill.
Perruchot, Henri. La Vie de Manet (Paris: Hachette, 1959), pp. 276-77. Rouart, Denis. Manet. Marion Schapiro, trans. (London: Oldbourne Press, 1960), p. 67. Treasures in America, exh. cat. (Richmond: The Virginia Museum of Fine Arts, 1961), p. 77, ill.
Rewald, John. The History of Impressionism. 3rd ed. (New York: The Museum of Modern Art, 1961), pp. 418-19, ill.
Perruchot, Henri. Manet. Humphrey Hare, trans. (London: Perpetua Books, 1962), p. 225. Charansonney, Roger. Manet (Paris: Le Musée Personnel, ), p. 15. Hanson, Anne Coffin. Édouard Manet, 1832-1883, exh. cat. (Philadelphia: Philadelphia Museum of Art, 1966), p. 157. Geröltei, Eugène. "L'Ancienne collection François de Hatvany." Gazette des beaux-arts, 6th ser., 67, nos. 1168-1169 (May-June 1966), p. 362. Mathey, Jacques. Graphisme de Manet. Vol. 3, Dessins et peintures réapparus (Paris: Librairie des Quatre-Chemins-Editart, 1966), p. 40, pl. 171. Neugass, Fritz. "Jubiläumsschau in der National-Galerie in Washington." Die Weltkunst 36, no. 8 (April 15, 1966), p. 336. French Paintings from the Collections of Mr. and Mrs. Paul Mellon and Mrs. Mellon Bruce: Twenty-Fifth Anniversary Exhibition, 1941-1966, exh. cat. (Washington, D.C.: National Gallery of Art, 1966), unpaginated, no. 42, ill. Pool, Phoebe. Impressionism (London: Thames and Hudson, 1967), p. 165. Orienti, Sandra, and Marcello Venturi. L'opera pittorica di Edouard Manet (Milan: Rizzoli, 1967), p. 108, no. 248A, ill.
Orienti, Sandra, and Phoebe Pool. The Complete Paintings of Manet (New York: Harry N. Abrams, 1967), p. 108, no. 248A, ill.
Schneider, Pierre. The World of Manet, 1832-1883 (New York: Time-Life Books, 1968), pp. 110, 141, 146-47, ill.
Sasaki, Hideya. Manet (Tokyo: Shueisha, 1970), p. 132, pl. 52. Orienti, Sandra, and Denis Rouart. Tout l'oeuvre peint d'Edouard Manet. Alain Veinstein, trans. (Paris: Flammarion, 1970), p. 108, no. 249A, ill.
Bazin, Germain. Edouard Manet. Maria Paola De Benedetti, trans. (Milan: Fratelli Fabbri, 1972), p. 56, fig. 2. Bazin, Germain. Édouard Manet (Paris: Diffusion Princesse, 1974), p. 56, fig. 2. 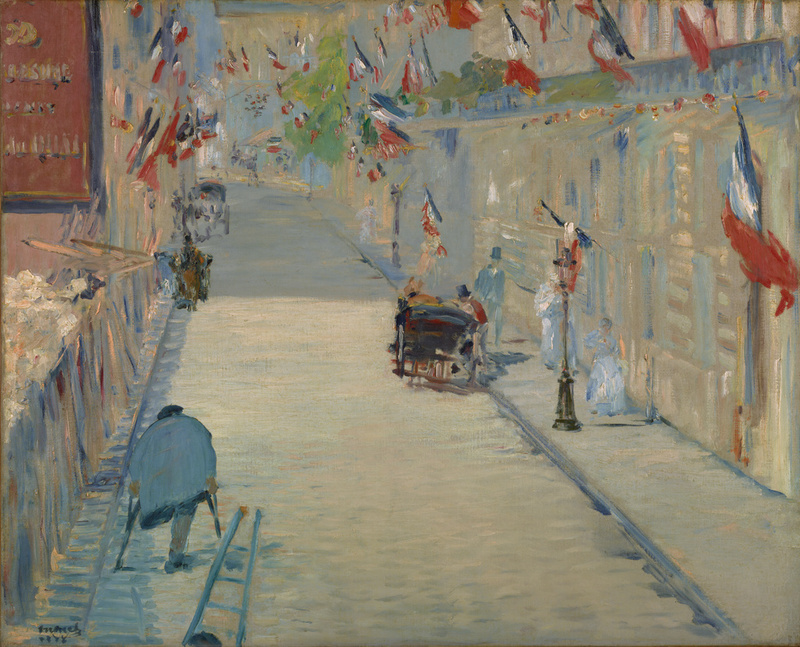 Collins, Bradford R. "Manet's 'Rue Mosnier Decked with Flags' and the Flâneur Concept." Burlington Magazine 117, no. 872 (November 1975), pp. 709-14, fig. 24. Rouart, Denis, and Daniel Wildenstein, eds. Edouard Manet: Catalogue raisonné. 2 vols. (Lausanne and Paris: La Bibliothèque des arts, 1975), vol. 1, pp. 216-17, no. 270, ill. Gay, Peter. Art and Act: On Causes in History-Manet, Gropius, Mondrian (New York: Harper & Row, 1976), p. 102, fig. 87. Monneret, Sophie. L'Impressionisme et son époque: dictionnaire international illustré. Vol. 2, M à T (Paris: Denoël, 1979), pp. 22, 114. Reff, Theodore. Manet and Modern Paris, exh. cat. (Washington, D.C.: National Gallery of Art, 1982), pp. 21-22, 232-33, 235, 236-37, no. 86, ill., pl. 14; p. 238, under no. 87; p. 240, under no. 88. Cachin, Françoise, et al, eds. Manet, 1832-1883, exh. cat. (Paris: Galeries nationales du Grand Palais; Éditions de la Réunion des musées nationaux, 1983), p. 397, under no. 158, fig. a; p. 404, under no. 163, entries by Françoise Cachin. Daix, Pierre. La vie de peintre d'Edouard Manet (Paris: Fayard, 1983), pp. 273-74. Druick, Douglas, and Peter Zegers. "Manet's 'Balloon': French Diversion, the Fête de l'Empereur 1862." The Print Collector's Newsletter 14, no. 2. (May-June 1983), p. 43. Schaefer, Scott, et al. A Day in the Country: Impressionism and the French Landscape, exh. cat. (Los Angeles: Los Angeles County Museum of Art, 1984), p. 122, under no. 28, entry by Sylvie Gache-Patin. Clark, T. J. The Painting of Modern Life: Paris in the Art of Manet and his Followers (New York: Alfred A. Knopf, 1985), p. 24, fig. 8. Kasl, Ronda. "Edouard Manet's 'Rue Mosnier': 'Le pauvre a-t-il une patrie?'" Art Journal 44, no. 1 (Spring 1985), pp. 49-59, fig. 1. Yakush, Mary, ed. Leonardo to Van Gogh: Master Drawings from Budapest, exh. cat. Janos Scholz, trans. (Washington, D.C.: National Gallery of Art, 1985), p. 212, under no. 98, entry by Veronika Kaposy. Laclotte, Michel, et al. L'Impressionnisme et le paysage français, exh. cat. (Paris: Galeries nationales du Grand Palais; Editions de la Réunion des musées nationaux, 1985), p. 198, under no. 71, entry by Sylvie Gache-Patin. Farr, Dennis. "Edouard Manet's 'La Rue Mosnier aux Drapeaux.'" In Essays in Honor of Paul Mellon, Collector and Benefactor. John Wilmerding, ed. (Washington, D.C.: National Gallery of Art, 1986), pp. 97-109, fig. 1. Fort, Ilene Susan. The Flag Paintings of Childe Hassam, exh. cat. (Los Angeles: Los Angeles County Museum, with Harry N. Abrams, 1988), p. 84, fig. 35. Gronberg, T. A., ed. Manet: A Retrospective (New York: Hugh Lauter Levin Associates, 1988), p. 253, pl. 75. Herbert, Robert L. Impressionism: Art, Leisure, and Parisian Society (New Haven and London: Yale University Press, 1988), pp. 30-32, 40, pl. 35. Roos, Jane Mayo. "Within the 'Zone of Silence': Monet and Manet in 1878." Art History 11, no. 3 (September 1988), pp. 374-407, fig. 54. Gerszi, Teréz, ed. Les plus beaux dessins de Léonard à Chagall. Éva Szilágyi, trans. (Budapest: Éditions Corvina; Paris: Éditions Belfond, 1988), p. 212, under no. 99, entry by Veronika Kaposy. Darragon, Éric. Manet (Paris: Fayard, 1989), pp. 299-301. Serri, Jérôme. Bleu, blanc, rouge: les couleurs de la France dans la peinture française (Paris: Librairie Séguier, 1989), pp. 10, 23, ill.
Harris, Nathaniel. The Paintings of Manet (New York: Mallard Press, 1989), p. 113. Christie's, New York. Important Impressionist and Modern Paintings, Drawings and Sculpture Collected by Mr. and Mrs. Paul Mellon. November 14, 1989, pp. 28-35, lot 7, cover ill. "Acquisitions/1990." The J. Paul Getty Museum Journal 19 (1991), p. 174, no. 11, ill.
Anda-Bührle, Hortense, et al., eds. The Passionate Eye: Impressionist and Other Master Paintings from the Collection of Emil G. Bürhle, Zurich, exh. cat. (Washington, D.C.: National Gallery of Art, with Artemis, 1990), under no. 25, ill., entry by Charles S. Moffett. Cachin, Françoise. Manet (Paris: Chêne, 1990), p. 124, fig. 3. Bacherich, Martine. Je regarde Manet (Paris: Éditions Adam Biro, 1990), p. 53. Darragon, Éric. Manet (Paris: Éditions Citadelles, 1991), pp. 278-79, fig. 198. Denvir, Bernard. Impressionism: The Painters and the Paintings (London: Studio Editions, 1991), p. 31, pl. 26. Kapos, Martha, ed. The Impressionists: A Retrospective (Southport: Hugh Lauter Levin Associates, 1991), p. 93, pl. 29. Heusinger von Waldegg, Joachim. James Ensor: Legende vom Ich (Cologne: DuMont, 1991), p. 140. Wilson-Bareau, Juliet, ed. Manet by Himself: Correspondence & Conversation; Paintings, Pastels, Prints & Drawings (London: Macdonald Illustrated, 1991), pp. 231, 312, pl. 181. Wilson-Bareau, Juliet. "Manet and The Execution of Maximilian." In Manet: The Execution of Maximilian. Painting, Politcs and Censorship, exh. cat. Juliet Wilson-Bareau et al., eds. (London: National Gallery, 1992), p. 78. Ota, Yasuto, ed. Manet by Manet (Tokyo: Nihon Keizai Shimbun, 1993), pp. 74-75, ill.
Gedo, Mary Mathews. Looking at Art from the Inside Out: the Psychoiconographic Approach to Modern Art (Cambridge: Cambridge University Press, 1994), pp. 14-15, fig. 4. Rubin, James H. Manet's Silence and the Poetics of Bouquets (Cambridge: Harvard University Press, 1994), p. 187, fig. 75. Cachin, Françoise. Manet, "j'ai fait ce que j'ai vu" (Paris: Gallimard; Réunion des musées nationaux, 1994), pp. 95-97, ill.
Fredericksen, Burton B., et al. Masterpieces of Painting in the J. Paul Getty Museum. 3rd ed. (Malibu: J. Paul Getty Museum, 1995), unpaginated, no. 41, ill., entry by Perrin Stein. House, John, et al., eds. Landscapes of France: Impressionism and Its Rivals, exh. cat. (London: Hayward Gallery, 1995), pp. 242-43, no. 89, ill., entry by John House. Moffett, Charles S. "An Icon of Modern Art and Life: Renoir's 'Luncheon of the Boating Party.'" In Impressionists on the Seine, exh. cat. Eliza E. Rathbone et al., eds. (Washington, D.C.: The Phillips Collection, with Counterpoint, 1996), pp. 135-36, fig. 71. Krell, Alan. Manet and the Painters of Contemporary Life (London: Thames and Hudson, 1996), pp. 185, 188-89, fig. 171. Fredericksen, Burton B., et al. Masterpieces of the J. Paul Getty Museum: Paintings (Los Angeles: J. Paul Getty Museum, 1997), pp. 102-3, no. 55, ill., entry by Perrin Stein. Walsh, John, and Deborah Gribbon. The J. Paul Getty Museum and Its Collections: A Museum for the New Century (Los Angeles: J. Paul Getty Museum, 1997), p. 131, ill.
Williams, Ellen. The Impressionists' Paris: Walking Tours of the Painters' Studios, Homes, and the Sites They Painted (New York: The Little Bookroom, 1997), pp. 70-71, ill.
Licht, Fred. Manet. Milena Gatti, trans. (Milan: Jaca Book, 1998), pp. 71-72, pl. 46. Galligan, Gregory. "The Self Pictured: Manet, the Mirror, and the Occupation of Realist Painting." The Art Bulletin 80, no. 1 (March 1998), pp. 163, 166, fig. 32. Wilson-Bareau, Juliet, ed. Manet, Monet, and the Gare Saint-Lazare, exh. cat. (Washington, D.C.: National Gallery of Art, with Yale University Press, 1998), pp. 130-43, 198, no. 41, figs. 116, 119. Wilson-Bareau, Juliet, ed. Manet, Monet, la gare Saint-Lazare, exh. cat. (Paris: Musée d'Orsay; Réunion des musées nationaux, 1998), pp. 130-43, 199, no. 41, figs. 116, 119. Elvers-Svamberk, Kathrin. "'L'esprit se fait à travers le corps': Zum Problem der Leiblichkeit im Werk Edouard Manets." Ph.D. diss. (Universität des Saarlandes, 1999), p. 120. Wood, Paul. "The Avant-Garde and the Paris Commune." In The Challenge of the Avant-Garde. Paul Wood, ed. (New Haven and London: Yale University Press, with The Open University, 1999), pp. 112, 127-28, pls. 81, 96. Nord, Philip. Impressionists and Politics: Art and Democracy in the Nineteenth Century (London and New York: Routledge, 2000), p. 39. Lewis, Mary Tompkins. Cézanne (London: Phaidon, 2000), pp. 194-96, fig. 120. Weinberg, H. Barbara, and Susan G. Larkin, eds. American Impressionists Abroad and at Home: Paintings from the Collection of The Metropolitan Museum of Art, exh. cat. (New York: American Federation of Arts, 2000), p. 36, under no. 2, fig. 5, entry by Susan G. Larkin. Brettell, Richard R. "Monet e Parigi." In Monet: i luoghi della pittura, exh. cat. Marco Goldin, ed. (Treviso: Casa dei Carraresi, with Linea d'ombra libri, 2001), p. 135, ill.
Conzen, Ina. "'Eine neue Welt': Edouard Manet und die Impressionisten." In Edouard Manet und die Impressionisten, exh. cat. Ina Conzen et al., eds. (Stuttgart: Staatsgalerie, with Hatje Cantz, 2002), pp. 111-12, 114, fig. 138. Conzen, Ina, et al., eds. Edouard Manet und die Impressionisten, exh. cat. (Stuttgart: Staatsgalerie, with Hatje Cantz, 2002), p. 238, no. 54, entry by Petra Buschhoff-Leineweber. Mena Marqués, Manuela B., ed. Manet en el Prado, exh. cat. (Madrid: Museo Nacional del Prado, 2003), pp. 310-13, 482, no. 98, ill., entry by Manuela B. Mena Marqués. Allen, Denise, et al. Masterpieces of Painting in the J. Paul Getty Museum. Rev. ed. (Los Angeles: J. Paul Getty Museum, with Thames & Hudson, 2003), pp. 98-99, no. 52, ill., entry by Perrin Stein. Weinberg, H. Barbara, et al., eds. Childe Hassam, American Impressionist, exh. cat. (New York: Metropolitan Museum of Art, with Yale University Press, 2004), pp. 61, 191, 217, fig. 55. House, John. Impressionism: Paint and Politics (New Haven and London: Yale University Press, 2004), pp. 110-11, 112, pl. 96. Forgione, Nancy. "Everyday Life in Motion: The Art of Walking in Late-Nineteenth-Century Paris." The Art Bulletin 87, no. 4 (December 2005), pp. 678-79, fig. 13. Sotheby's, New York. Impressionist & Modern Art. November 8, 2007, p. 166, under lot 202, fig. 1. Berg, William J. Imagery and Ideology: Fiction and Painting in Nineteenth-Century France (Newark: University of Delaware Press, 2007), pp. 193-201, ill. The J. Paul Getty Museum Handbook of the Collections. 7th ed. (Los Angeles: J. Paul Getty Museum, 2007), p. 141, ill.
Wilson-Bareau, Juliet. "Manet's 'Reichshoffen': the hidden story." In Division and Revision: Manet's 'Reichshoffen' Revealed. Mariantonia Reinhard-Felice, ed. (London: Paul Holberton, 2008), p. 53. Dixon, Christine. "Nature Becomes Art: Landscape and Modernism." In Turner to Monet: The Triumph of Landscape Painting, exh. cat. Christine Dixon, Ron Radford, and Lucina Ward, eds. (Canberra: National Gallery of Australia, 2008), pp. 37-38, fig. 19. Fischer, Hartwig, et al. Bilder einer Metropole: Die Impressionisten in Paris, exh. cat. (Essen: Museum Folkwang, 2010), pp. 125, 304-5, no. 46, ill.
Mathieu, Caroline. "Le Paris de Manet." In Manet et le Paris moderne, exh. cat. (Tokyo: Musée Mitsubishi Ichigokan, 2010), pp. 22-23, 301, fig. 3. Bell, Julian. "Manet: 'Sudden Sensuous Dazzle.'" The New York Review of Books 58, no. 12 (July 14, 2011), p. 19, ill.
Guégan, Stéphane. Manet: l'héroïsme de la vie moderne (Paris: Gallimard; Musée d'Orsay, 2011), unpaginated, ill.
Guégan, Stéphane, et al., eds. Manet inventeur du Moderne, exh. cat. (Paris: Musée d'Orsay, with Gallimard, 2011), pp. 248, 256, 282-83, no. 176, fig. 224. Wilson-Bareau, Juliet. "The Manet Exhibition in Paris, 2011." Burlington Magazine 153, no. 1305 (December 2011), p. 823. Péter, Molnos. "A Nemes-Gyújtemény Modern Külföldi Festményei / The Modern Foreign Paintings of the Nemes Collection." In El Grecó tól Rippl-Rónnaiig: Nemes Marcel, A Mecénás Múgyújto / El Greco to Rippl-Rónai: Marcell Nemes, Art Patron and Collector, exh. cat. István Németh and Orsolya Radványi, eds. (Budapest: Museum of Fine Arts, 2011), pp. 109, 110, 114n97, 122, 125n97, fig. 23. Rabb, Theodore K. The Artist and the Warrior: Military History through the Eyes of the Masters (New Haven and London: Yale University Press, 2011), p. 182, fig. 83. Jurk, Michael. "Kunstsammler zwischen Geschäft und Leidenschaft. Der Bankier Jakob Goldschmidt." In Aufbruch in die Moderne: Sammler, Mäzene und Kunsthändler in Berlin, 1880-1933. Anna-Dorothea Ludewig et al., eds. (Cologne: DuMont, 2012), pp. 197, 206. Karlholm, Dan. "Misery, Beauty, and Other Issues: Linda Nochlin in Conversation with Dan Karlholm." The Art Bulletin 94, no. 2 (June 2012), p. 196. Meier-Graefe, Julius. Édouard Manet. Victor Claass, trans. ([Paris]: Klincksieck, 2013), p. 136n32. Kelly, Simon, and April M. Watson, eds. Impressionist France: Visions of Nation from Le Gray to Monet, exh. cat. (Saint Louis and Kansas City: Saint Louis Art Museum and the Nelson-Atkins Museum of Art, with Yale University Press, 2013), pp. 112-13, no. 21, ill., entry by Simon Kelly. Echte, Bernhard, and Walter Feilchenfeldt, eds. 'Ganz eigenartige neue Werte.' Kunstsalon Paul Cassirer: Die Ausstellungen 1908-1910 (Wädenswil: Nimbus, 2013), pp. 412, 424, 428, 433, 439, ill. p. 428. Woodward, Richard B. "As France Took Form in Paint and Photographs." Wall Street Journal (April 22, 2014), http://online.wsj.com/news/articles/SB10001424052702303663604579503591118003008 (accessed May 29, 2014). Molnos, Péter. Lost Heritage: Hungarian Art Collectors in the Twentieth Century (Budapest: Kieselbach, 2018), p. 294, ill.